‘EHOS has been performing musicals and plays in Hertfordshire since 1960. From our first production of ‘The Mikado’ in 1961, we have shown our diversity and talent by performing in a variety of different productions. We continue to challenge ourselves, with the aim of producing at least two fresh and innovative pieces of theatre every year at theatres in Hertfordshire. EHOS is one of the county’s leading theatre companies. We welcome new members to join at any time, and previous acting experience is not necessary. We pride ourselves on offering something for everyone and continuously welcome new people of all ages, on or off stage. 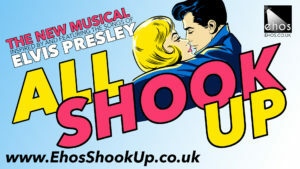 Upcoming Shows : All Shook Up! EHOS are delighted to be returning to the Victoria Hall Theatre in March 2019 with the smash hit musical ‘All Shook Up’, featuring the songs of Rock and Roll legend Elvis Presley. With a plot inspired by Shakespearean comedie, especially ‘Twelth Night’ – it is an original tale packed with romantic yearnings, mismatched partners, deception and disguise. 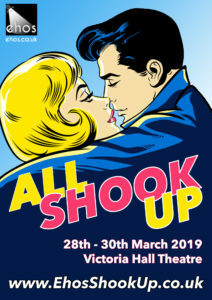 All Shook Up follows a small Midwestern town that is thrown into a frenzy with the arrival of Chad, a good-looking, motorcycle-riding roustabout, who rides from town to town with a guitar on his back, blue suede shoes on his feet, and a song in his heart. Repressed by their conservative mayor, the town begins to come alive once more under Chad’s influence. Lovers meet, woo, pursue, and more, all in one zany night that will change the town forever. All Shook Up is a rocking, heartwarming tale about following dreams, opening up to love, and the power of music. 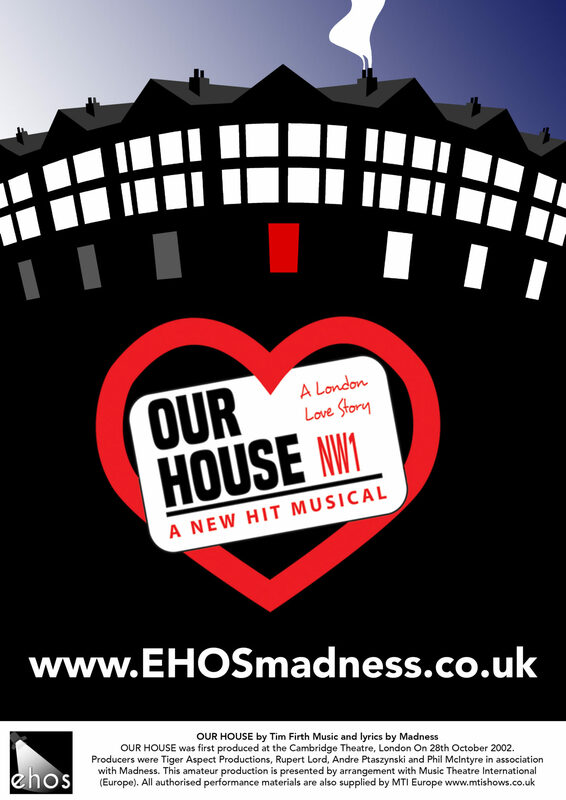 EHOS are delighted to announce our September 2019 productions will be ‘Our House’, the critically acclaimed coming-of-age story featuring the hits of the iconic ska brand Madness, will be at The Spotlight in September 2019. When an ill-conceived date lands London lad Joe Casey face to face with the police he faces a tough decision: to run or give himself up. As the story splits in two as we follow the fortunes, and misfortunes, of Good Joe and Bad Joe. We are currently looking for directors & choreographers for the show. If you would like to apply, then please contact us at info@ehos.co.uk or click HERE for more information.